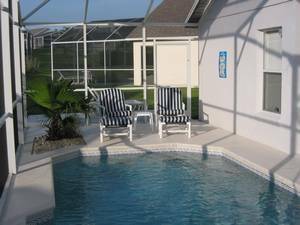 This 3 bedroom 2 bathroom Villa with private pool is situated on Southern Dunes Golf and Country club 19 minutes from Disney. This beautiful home has all the amenities you will need to have a luxury vacation. 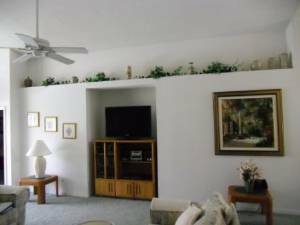 The lounge has ample seating for 6 with a 46 inch TV, DVD and Radio/CD music system. The master bedroom has an ensuite and large walk in wardrobe. There are 2 further bedrooms, each with Cable TV, which share a family bathroom. 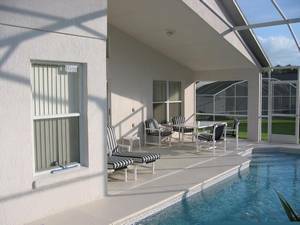 The 600 sq ft extended Pool area has quality deck furniture and is N.S.E & W facing. Extended deck means N, S, E & W facing!! Just 19 minutes from Disney World, Orlando, Florida. 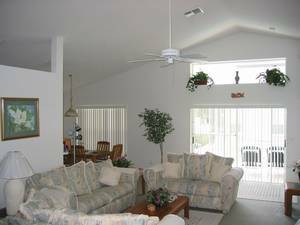 Fully air conditioned lounge featuring 46" Cable TV with DVD/Sterio and high quality sofas seating 6. 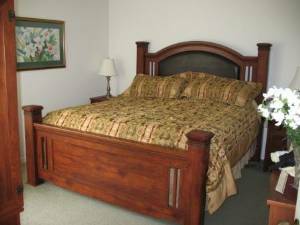 Master en-suite bedroom with Cable TV, walk in closet and large master bathroom with walk in shower. Myself & my family stayed at the villa from 5.7.03. to 19.7.03. & I must say that we were all very impressed by the standard of luxury of this very roomy property, The swimming pool was of good size & depth for supervised children & we found it very handy to have our own washing machine & dryer as this helped us to keep the amount of clothes we had to bring with us to a minimum & allowed us to bring back more presents in our luggage, I personally have visited Florida on 3 occasions before this but I can definitely say that this was the most comfortable property that I have stayed at in Florida!, I can say that we will definitely be visiting some time in the future & therefore I can recommend this property to any prospective holiday makers ! We stayed in the villa for two weeks in June/July 2002 and I can honestly say that it was a holiday of a life time. 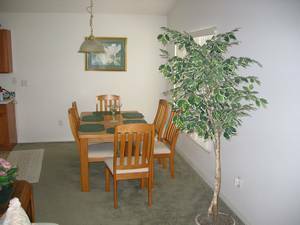 The house itself is very comfortable and spacious, and the location couldn't be better- there is always something to do! The villa swimming pool was a big bonus- very refreshing in the warm weather, and the patio area was ideal for BBQs and entertaining. Our holiday included visiting Islands of Adventure, Universal Studios, Sea World, Boggy Creek Alligator Park, the Everglades, Florida Keys to scuba dive and much, much more. We were never short of places to eat and the selection of food on offer is amazing. 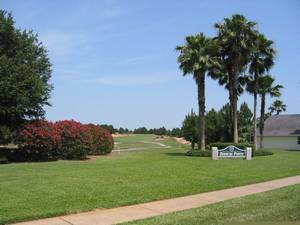 The house is surrounded by an imaculate golf course and the grounds beyond the golf course are beautiful with a lake, tennis courts and more swimming pools. It was great to be able to either play tennis or go swimming every morning. The holiday was relaxing as well as entertaining. I would highly recommend it to anyone. I'm ready to go back at any minute! I cannot recommend this villa highly enough! My family and I had a marvellous 3 week holiday in 2000 and are returning next year - we have booked 3 weeks in the summer 2004 - we can't wait! Everything you need for your stay is available in the villa. The pool is lovely and so important for the children and adults alike! My parents came with us in 2000 and loved the accommodation. The beds are very comfortable and the kitchen is well stocked with everything (not that we cooked much!). 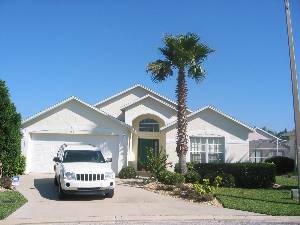 The villa is just right for visiting all the Disney parks and Universal Studios and close to major shopping outlets. Don't delay book up - ring Teresa and Ken now!!! Deposit: $200 per week booked. Cancellations and Refunds: In the event of a cancelation for any reason whatsoever the following charges will apply. More than 8 weeks - deposit only. 5-8 weeks 50% of rental cost. Within 5 weeks - 100% of rental cost.